Morganite is a type of beryl, which means it’s in the same family as emeralds, aquamarines, heliodor and others. But while emeralds are green and aquamarines are usually blue, morganite’s shades range from peach pink to rose pink, though orange or salmon colored varieties are found. Its chemical formula is Be3Al2SiO6, and the pink color is caused by the presence of manganese ions. Sometimes, the crystal is heated to bring out more of the pink hue. In this article, we will focus on the physical and metaphysical properties of the gemstone, its discovery and how and where to buy it. Morganite was discovered in 1910. Some gemologists claim it was discovered in California, while others claim it was found in or near Madagascar. It was named after the tycoon J.P. Morgan by gem buyer George Frederick Kunz, who was an official at Tiffany & Company and a member of the New York Academy of Sciences. Morgan was known for his passion for collecting gemstones and donated many beautiful gems to the Museum of Natural History in Paris and the American Museum of Natural History in Manhattan. 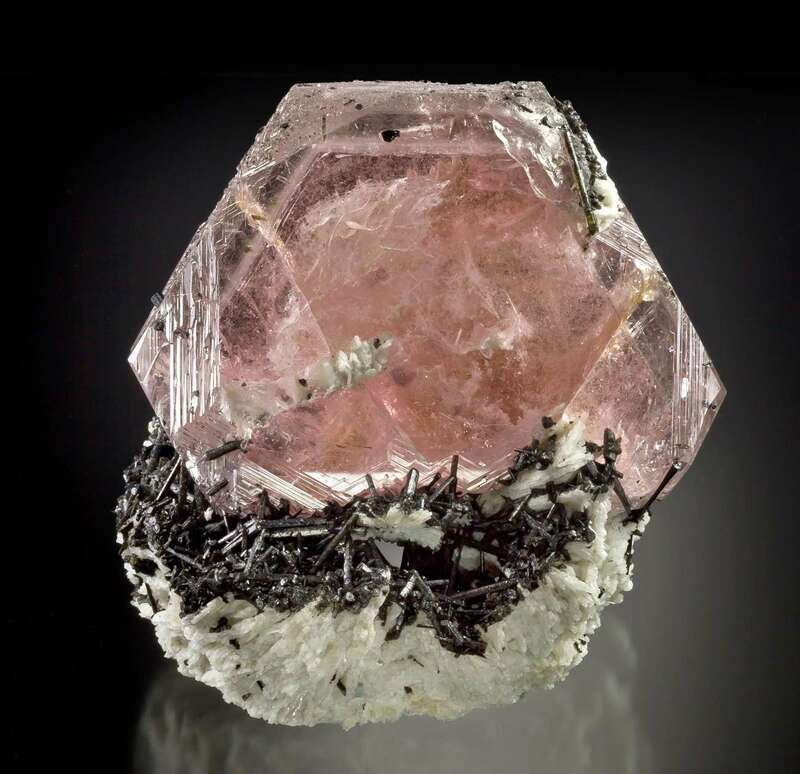 Like other forms of beryl, morganite has a hexagonal crystal system. It has a Mohs scale hardness range of between 7.5 to 8 and a refractive index, or RI of 1.57 to 1.58. The RI is a measurement of the angle of light as it penetrates the gemstone. The crystal is transparent to translucent, which means it allows light to penetrate and has a vitreous or glassy luster. It has a specific gravity of 2.80 to 2.91, which means it is 2.8 to 2.91 times denser than water. It has a birefringence of 0.003 to 0.010. Birefringence is the difference between the highest and lowest possible RI of the gemstone. It has a brilliantly red fluorescence under X-radiation. Fluorescence is the emission of light by a material when it’s exposed to a wavelength of higher energy. However, the red light does not linger when the X-rays are removed, which means that morganite lacks phosphorescence. Morganite is often found in square crystals that are flat like the top of a table. They often have bands of color. They are often blue near the bottom, almost colorless in the center and pink at the top. It also opens the solar plexus and crown chakras, calms a person’s mind and gives them courage and the ability to concentrate and ignore distractions. Morganite imparts a positive outlook and eases anxiety and overthinking. It is good for reviving love in married couples whose love has faded. When it comes to healing, beryl supports the functioning of the lower gastrointestinal tract and the urinary bladder. It strengthens the lungs by removing blockages ad treating tuberculosis, asthma, and emphysema. It helps the circulatory system and bolsters resistance to pollutants and other toxins. Morganite is also helpful for concussions and heals disorders of the heart, liver, spine and stomach and can be used as a sedative. When morganite is used in an elixir, it treats a sore or infected throat. Morganite’s special properties apart from the general benefits of beryl are that it attracts and maintains love. It inspires loving deeds and thoughts and cleanses the heart chakra. It removes mental blocks that can impede spiritual growth and helps a person recognize unfulfilled needs and feelings that they can’t express. Furthermore, it also oxygenates cells and treats vertigo and impotence. Though there may not be too many famous examples of morganite jewelry, it is becoming more and more popular in the form of engagement rings, necklaces, bracelets, and earrings. Jewelry makers often use it with rose gold that complements its pink hues. They also often enhance it with diamonds, white topaz or white sapphires. Though morganite is rare, you can still find many excellent gemstones at reasonable prices. Gemologists believe this is because the crystal has not been promoted as heavily as aquamarines or emeralds. Even flawed examples of the crystal can be used for beads and cabochons. Like diamonds, the quality of morganite depends on its color, its clarity, its cut and its carats, or size. The best crystals have a strong pink color and are eye clean. This means their flaws are not visible to the naked eye. Unlike diamond, which should be cut perfectly, morganite’s cut can be deeper to bring out its color. Morganite is a fairly tough stone that can be worn daily. It should be kept away from excess heat and handled with care if it has many flaws. You can purchase this gem at any high-quality jewelry store. Despite their size, many morganite crystals are flawless and can be cut, polished and faceted. Some crystals have liquid flaws that hold gas bubbles. The best quality morganite is still found in Madagascar, though the mines there have diminished in economic importance. Morganite is a beautiful, subtly colored jewel whose popularity is increasing. It is hard enough to be shaped into many of the same cuts as diamonds, such as rose, pear-shaped or cushion and can be used in many types of settings with other jewels and precious metals. Hey Buddy!, I found this information for you: "Morganite and Its Shades that Lavishly Spell Sophistication". Here is the website link: https://accessgems.com/morganite/. Thank you.